Marking the beginning of a new year according to the Hebrew calendar. 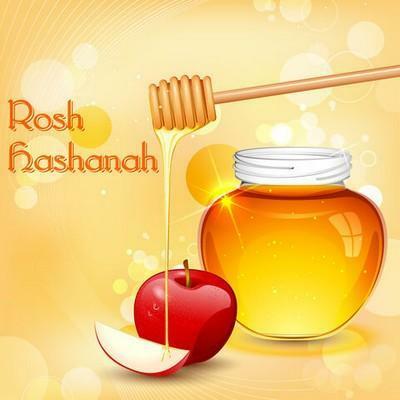 There are a number of foods that are symbolic of Rosh Hashana. It is customary to eat sweet foods like slices of apple dipped into honey which represent a new year that will be sweet. Honey cake is another popular food eaten during Rosh Hashana. Round Challa (bread) is always served on Rosh Hashana symbolizing the circle of life. On the second night of Rosh Hashana it is customary to eat a fruit that has just come into season. The most common fruit eaten is the pomegranate which has to do with the hope that we will do as many good deeds in the coming year as there are seeds in the pomegranate. The blowing of the Shofar (Ram’s horn) is a very important symbol of the Jewish New Year and it is blown 100 times during each day of Rosh Hashana. There are many associations to the blowing of the shofar, one of them being when God asked Abraham to sacrifice Isaac. The story is recounted in Genesis 22:1-13 and concludes with Abraham raising the knife about to slay his son only to have God stay his hand and bring his attention to a ram caught in a nearby bush. Abraham sacrificed the ram instead. Rosh Hashana is a time for families to get together, have a festive meal and celebrate the beginning of a new year that will hopefully be filled with joy, love and peace.